For Minnesotans upgrading their backyard, including a heat feature is a wonderful addition that allows enjoyment of the outdoors well-past summer. A heat source a fun place to gather family and friends for roasting marshmallows or long chats into the night. But which kind of heat feature is best for you? Overall, installing an outdoor fireplace is ideal for a family setting. Unlike a fire pit or table, a fireplace keeps the fire more contained while directing the heat toward your lounge area. There’s no need to worry about flying embers or ashes, though, thanks to that containment. The chimney also guides harmful smoke out the top to protect your air quality. That protection makes a fireplace the best choice for those who wish to host larger group of guests, and there’s the bonus of being able to roast certain foods. In some cases, though, smoke and ash might not be an issue at all; many outdoor fireplaces have the option of being gas. A gas fireplace saves you the trouble of gathering wood and cleaning ashes, but it might require a gas line. No matter the fuel source, built-in fireplaces are ideal for their customization. There are lots of pre-made ones out there, but there’s also the option of designing it yourself. 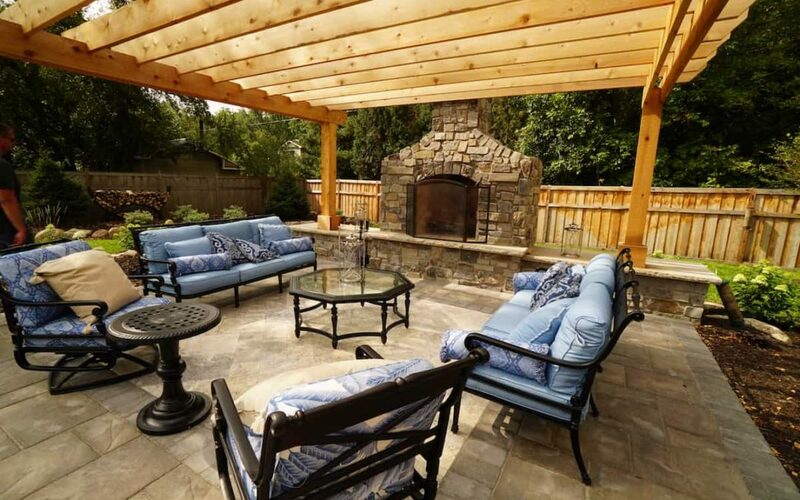 Add a homey vibe to your outdoor living and enjoy the warmth as you entertain. Give us a call to get started on transforming your backyard!